Introduction: Percutaneous endoscopic gastrostomy (PEG) placement is commonly performed. The safety of this procedure is predicated on the ability to bring the anterior gastric wall in apposition to the abdominal wall, as confirmed by transillumination. Prior gastric resection, hepatomegaly, obesity, and intraabdominal adhesions can prohibit transillumination. 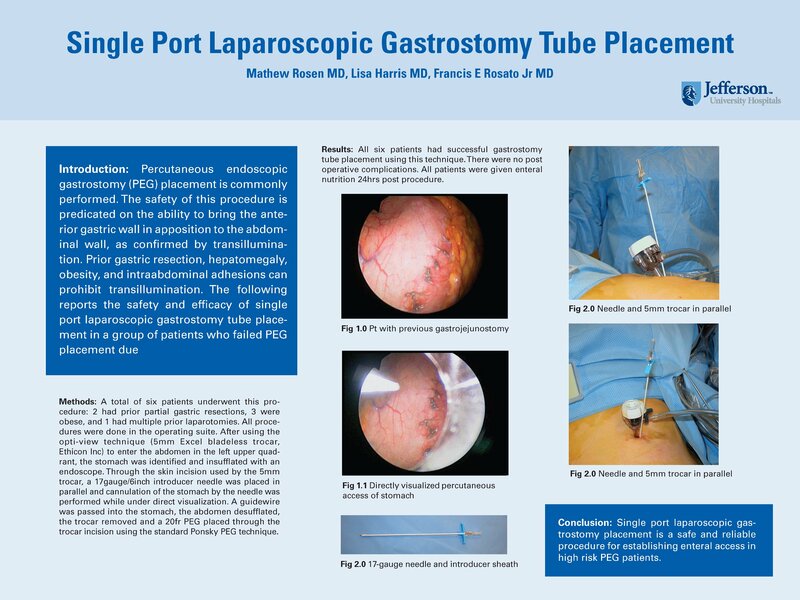 The following reports the safety and efficacy of single port laparoscopic gastrostomy tube placement in a group of patients who failed PEG placement due to inadequate transillumination. Methods: A total of six patients underwent this procedure: 2 had prior partial gastric resections, 3 were obese, and 1 had multiple prior laparatomies. All procedures were done in the operating suite. After using the opti-view technique (5mm Excel bladeless trocar, Ethicon Inc) to enter the abdomen in the left upper quadrant, the stomach was identified and insufflated with an endoscope. Through the skin incision used by the 5mm trocar, a 17gauge/6inch introducer needle was placed in parallel and cannulation of the stomach by the needle was performed while under direct visualization. A guidewire was passed into the stomach, the abdomen desufflated, the trocar removed and a 20fr PEG placed through the trocar incision using the standard Ponsky PEG technique. Results: All six patients had successful gastrostomy tube placement using this technique. There were no post operative complications. All patients were given enteral nutrition 24hrs post procedure. Conclusion: Single port laparoscopic gastrostomy placement is a safe and reliable procedure for establishing enteral access in high risk PEG patients.